Curtly Hampton looks set for a major role in the midfield this season. He was great in close, recording a teamhigh 10 pre-clearance contested possessions. The Lions were able to match the Crows from stoppage in the end, scoring 9.2 (56) compared to their 9.5 (59) from clearance chains. Dayne Beams generated an equal gamehigh eight clearances. The Lions have exceeded 100 points in just six games since the start of last season, with one of these being today. They have finished the game off strongly, scoring four of the last five goals of the game. Dayne Beams and Tom Rockliff have been excellent in the clinches, recording an equal gamehigh 10 pre-clearance disposals each. Curtly Hampton has led the way for the Crows with nine. Brisbane's impressive goal conversion has kept the margin from blowing out, recording 5.1 from set shots and 7.1 from general play. It has recorded 15 fewer scoring shots for the game. One of Brisbane's prime movers, Dayne Zorko, has been very quiet after half time, recording just four disposals. He had 11 disposals to his name at half time. The Crows were the No.1 scoring side in second halves in 2016, and they have shown this today. They have recorded 13 scoring shots to five after half time, leading the inside 50s 2212. 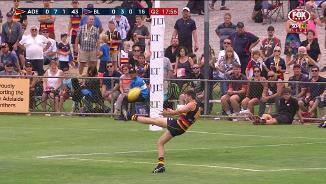 Josh Jenkins boots Adelaide's second goal from beyond the 50metres arc. He has now booted an equal game-high four goals for the match. 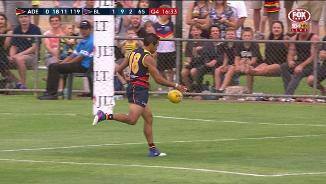 Eddie Betts end his run of three consecutive behinds to boot his first goal of the match. The Crows have now opened up a gamehigh lead of 54 points. Rory Laird's ball use in the defensive half of the ground has been a feature of his game. Of the 19 disposals he has recorded in that zone, all but one have been effective. Dayne Beams is playing a lone hand for the Lions, recording 11 more disposals than any other team mate. He also has teamhighs for contested possessions, clearances and score involvements. Adelaide has launched all four of its goals from the attacking midfield zone for the third term. It has generated 45 points to just 16 from that zone across the game. Mitch McGovern records Adelaide's 11th mark inside 50 for the match, of which Taylor Walker has recorded a teamhigh three. The Lions have recorded three contested marks inside 50. After conceding 12 of the opening 14 inside 50 entries for the third term, Brisbane has regained some composure to generate the next next entries of the match. Stefan Martin boots the Lions' opening goal of the term. The Lions are under the pump in the third term, conceding 2.4 (16) to zero points, despite recording just two fewer disposals for the term. Adelaide has been extremely efficient with its ball movement through the corridor in the third term, recording a disposal efficiency of 100 per cent. Brisbane has hit the target 73 per cent of the time. Adelaide's opening goal for the third term comes from a throw in clearance chain. It has generated 3.2 (20) to 1.1 (7) via that source across the game. Forgotten Adelaide defender Andy Otten continues to push for a Round 1 start. He has recorded 14 disposals and a gamehigh five intercept possessions. Dayne Beams lifted his work rate in the second term, recording 11 disposals, six contested possessions and one goal. He is the leading disposal winner on the ground with 18. Adelaide has worked extremely hard in the forward half of the ground, with eight of its goals launched from that zone compared to Brisbane's two. Taylor Walker has recorded an equal gamehigh 10 disposals in that zone. Both teams have booted six goals apiece in what has been a free flowing second term. The two teams have generated four goals each from clearance chain in this term. Curtly Hampton's stellar JLT Community Series has continued, racking up an equal teamhigh 13 disposals. 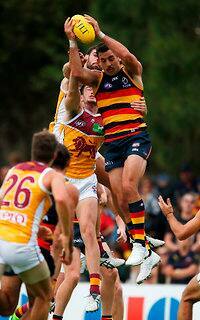 He has won eight contested possessions which is three more than any other Crows player. Two of Adelaide's four goals in the second term have come from turnovers. Its ability to punish the opposition turnover was a key strength to its game in 2016, scoring 25 more points per game compared to its oppositionranked No.1. After losing the contested possession count narrowly by two in the opening term, Brisbane has hit back in the second, leading the count by eight. It has been outplayed in space, recording 28 fewer uncontested possessions than the Crows. Taylor Walker becomes Adelaide's third multiple goalscorer for the match. He is giving his opponent the runaround, recording nine disposals and a gamehigh six marks (one contested). Adelaide goalsneak, Eddie Betts, has been extremely quiet by his standards, with just two disposals to his name. He has recorded just one scoring shot (0.1). Both of Brisbane's goals in the second term have come from clearance chains. It has scored four goals to three via that source across the match. Brisbane Lions InterchangeRyan Lester off due to an injury. Mitch McGovern boots Adelaide's seventh and his third goal off the match. He and Josh Jenkins (three) are the leading goalscorers on the ground. Luke Brown, Brodie Smith, Rory Laird and Rory Atkins have won 17 disposals between them in the defensive half of the groundrecording a disposal efficiency of 100 per cent each. On the spread, Brisbane has won seven more disposals than Adelaide, hitting the target 10 per cent more often. The Lions also lead the marks 2616. Sam Jacobs and Stefan Martin has been a fascinating duel. Jacobs leads the hitouts headto-head 6-4 and hitouts-to-advantage 3-1. Around the ground, Jacobs has recorded three disposals to Martin's five. Adelaide's ball movement has been predominantly done via the left boundary zone. It has recorded 25 disposals to five in that zone. Both sides are have made the most of their attacking opportunities, recording a scoring accuracy off 100 per cent apiece. The Crows have booted three goals from set shots, while both of the Lions' goals have come via that source. The Lions have struggled to generate many forays into attack. They have recorded just once disposal inside 50 compared to Adelaide's eight. Adelaide is well on top around the stoppages, it leads the clearances by five. Matt Crouch leads the way with two clearances. The Crows generate their second goal of the match from a clearance chain. They outscored their opposition by six points per game via that source last season, ranked sixth. Josh Jenkins gets Adelaide's second goal of the match. He ranked second at the club for both goals and scoreboard impact behind Eddie Betts in 2016. Matt Crouch has picked up from where he left of last season, leading the club for contested possessions and clearances, and ranking second for disposals. He ranked equal 11th for disposals per game from Round 11 last season. Dayne Beams played his first game last week since Round 8 last season. He finished with 24 disposals, four clearances and three tackles from just 61 minutes game time. 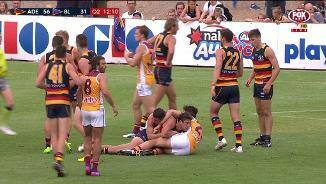 Welcome to Hickinbotham Oval for the Adelaide Crows v Brisbane Lions Round 4 clash. 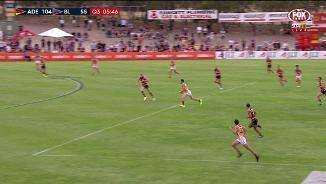 ADELAIDE'S high-octane forward line exploded into life ahead of round one as the Crows accounted for the Brisbane Lions by 39 points at Hickinbotham Oval on Saturday. Josh Jenkins (five goals including a supergoal), captain Taylor Walker (three), Mitch McGovern (four) and Eddie Betts (three) gave the youthful Lions backline nightmares in the final JLT Community Series game for both sides. Defence was a low priority with 37 goals kicked between the two teams as the Crows emerged on top 1.20.13 (142) to 1.15.4 (103). 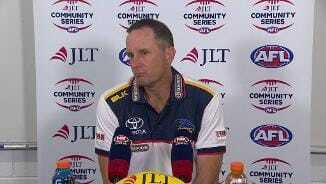 "It was not so much about today, but the whole JLT Series," Crows coach Don Pyke said. "As a whole block of games, it finished off our preparation well. "It's been great to give some guys some different opportunities in different roles and we saw that again today with a number of guys going into the midfield. "I thought we played some really positive footy today." The two Rory's – Atkins and Laird – found plenty of the footy with 30 possessions each, while Richard Douglas was busy in his new role across half-back with 27 touches. Curtly Hampton did his case for a midfield spot against Greater Western Sydney in the season opener no harm with another solid effort, finishing with 26 disposals. Defender Andy Otten seems certain to make his first premiership appearance in three years after continuing his good form. 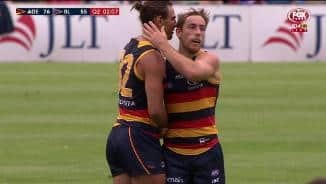 The only worry for the Crows was that Walker came off the ground at three-quarter time with hamstring tightness and did not play any further part in the match. Despite the end result, the Lions won't be too disappointed against one of the premiership contenders. 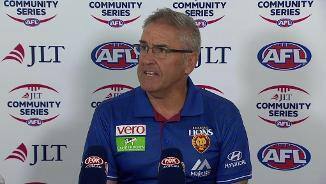 "There is lots to be positive about, good fight in the last quarter, some good footy in the first half, but we're all about getting better and rising as a footy club and I thought there were some great signs today," Lions coach Chris Fagan said. "We were pretty happy with our pressure in the first half, dropped away significantly in the third and came back a bit in the last. "We can see our players are starting to understand the way we want them to play." Skipper Dayne Beams was absolutely everywhere, picking up a game-high 35 possessions. Ruckman Stefan Martin turned out a dominant performance around the ground, while defender Darcy Gardiner shut down Betts for the first three quarters. McGovern showed why the Crows are desperate to re-sign him beyond the end of this season with his marking ability inside the forward 50. Only 28 seconds had elapsed when McGovern booted the opening goal. Holding a 28-point advantage at half-time, the Crows stepped up the intensity after the break and blew the Lions away in the third term. Walker was taken off the ground at three-quarter time for a well-earned rest as the Lions kept the final score respectable. Crows midfielder Riley Knight was a late scratching with an Achilles injury and is unlikely to feature in the side to face Greater Western Sydney in round one. 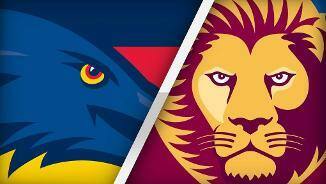 The Lions take on Queensland rivals Gold Coast at Metricon Stadium in their season opener. Adelaide: The Crows' forward line is going to be as dangerous as ever this season. Taylor Walker, Josh Jenkins and Mitch McGovern feasted on terrific service from the midfield and ran over a youthful Lions' backline. McGovern's marking ability inside the forward 50 is going to provide a match-up nightmare for opposition teams. Brisbane Lions: After a forgettable 2016, ruckman Stefan Martin could be one of the dominant big men in the competition. He was brilliant around the ground, racking up plenty of disposals and dominating his ruck duels with Sam Jacobs. 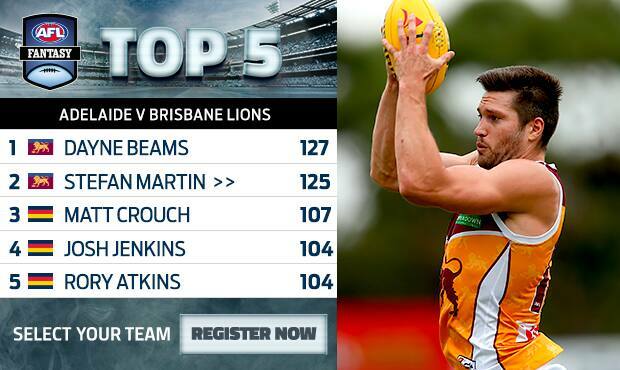 The Lions are yet to decide whether he plays as a solo ruck or they have a tandem with Archie Smith. 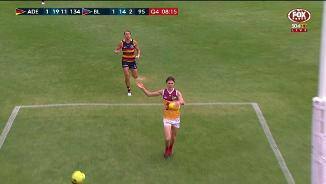 Adelaide: Defender Jake Kelly put his hand up as a surprise candidate for a spot in Adelaide's backline with a strong game. Kelly had 16 possessions and took seven marks in an impressive display. It will likely be a choice between him, Andy Otten and Kyle Cheney for the final place in the Crows' side to face Greater Western Sydney. Curtly Hampton again pressed his claims for a midfield berth, while first-year player Jordan Gallucci was quiet. 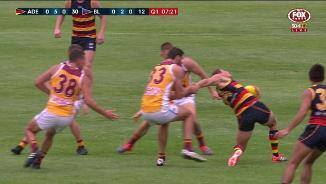 Brisbane Lions: Debutant Cedric Cox had quite the initiation to the big time, getting bumped off the ball by Eddie Betts in his first involvement in the game. Cox – the No.24 overall pick in the 2016 NAB AFL Draft – worked his way into the game after that in defence. Swingman Daniel McStay was a little bit rusty in his first game since a serious ankle injury in round 17 last year, but will be better for the run. GWS recruit Jake Barrett had another solid game with 15 touches. The Crows will be hoping star midfielder Rory Sloane returns from injury for their round one clash with premiership favourites, the Giants, at Adelaide Oval on Sunday, March 26, 2.50pm ACDT. Meanwhile, the Lions open their campaign with a QClash against Gold Coast at Metricon Stadium on Saturday, March 25, 7.05pm AEST.